Presentation of the subject is designed on “teach-yourself” technique which enables students to learn faster. Unit 1 covers income-tax/TDS. Service tax is discussed in Unit 2. Income-tax law is presented in Chapter 1 in tabular form which will serve as a guide to readers to refresh their knowledge. Provision pertaining to e-filing of income-tax returns/TDS returns are given in subsequent chapters. 2 Case Studies for e-filing of service tax returns. 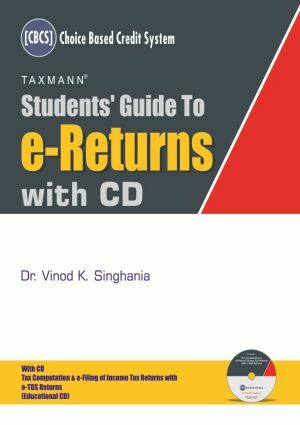 One can generate e-returns with the help of “Tax Computation &e-filing of income-tax return” and “e-TDS returns” (Educational CD) provided along with this book. Teachers may obtain XML files ofthese Case Studies by writing a mail (from their college mail id) to vks@taxmann.com. The law stated in this book is as amended up to December 15, 2016.